I thought it might be fun to look back over the past year to see just how far we have come as an organization, so here is my “State of WASBA” address. After a long absence, WASBA has reinstituted our annual beekeepers conference. We have a great conference committee who have worked together to pull this off. As of this writing, we have nearly 150 participants signed up for the event and we expect 200+ attendees. For those of you who don’t know, the conference will be on February 9th at Eastern Washington University. If you haven’t done so already, sign up soon because the cost goes up next week from $35 to $45. We currently have people attending from all parts of Washington as well as from Montana, Idaho, Oregon, and British Columbia. We have a number of excellent sponsors including our GOLD Sponsors, Mann Lake and Glory Bee, and our Silver sponsors, EWU, Hierophant, and Holiday Inn Express. We’ll also have 15 vendor booths where you’ll be able to find just about anything bee related. Finally, we have over $1500 in raffle donations and all money raised during the raffles will go directly to grants to graduate students in the state who are working on bee related research. Tim Hiatt, our Legislative Liaison, has been working diligently on getting a bill passed through the state legislature that will protect beekeepers from liability. Ellen Miller and her Education committee have been working on updating all of our education materials and have the Beginning, Apprentice, and Journeyman courses all up to date and ready for deployment to any associate club that wants to teach a class. The Conference Committee is finishing up this conference, but also looking toward the meeting next year and the year after that. We are currently looking at holding next year’s conference in the Tri-cities and the year after that somewhere on the west side of the state. 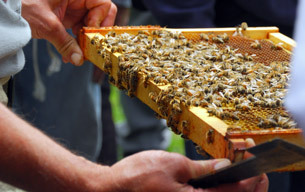 We have also reconnected with WSU and are setting up “Field Days” this summer (the first one will be sometime in June) where beekeepers can meet with faculty doing bee research and learn about the best new methods for keeping bees and preventing diseases. We have helped implement beekeeping courses throughout the WA State Department of Corrections, and now have several prisons offering beekeeping courses to their inmates. A number of clubs have joined or rejoined WASBA and our membership has more than tripled. Overall, WASBA has made some significant advances in the past year and with your continued support and help we’ll continue to do even more next year. Please think about volunteering to help on one of our committees next year, we are always looking for help and the commitment is usually not more than a couple hours a month. We currently have standing committees in Education, Legislative, Outreach, Conference, Finance, and Grants. If you are interested, please just grab one of the current Board members at the meeting and give them your contact info and we’ll get in touch. I hope to see all of you at our conference on February 9th, at EWU!